Is It Right to Assume That All Students Need College? We are in the midst of a heated national debate over whether or not high schools should try to prepare all students for college. I say yes, but I acknowledge that the no side has a good argument: Since at least a third of high schoolers don’t want to go to college, why not train them for the job market instead? The suggestion makes sense, until you look carefully at what it takes to get a good job after high school these days. Those of us who support the college-for-all approach are marking up the latest “Diplomas Count” report from Education Week — “Ready for What? Preparing Students for College, Careers, and Life After High School” available at edweek.org — and waving it in front of our friends on the college-not-for-all side. It shows that the latest data are running in our favor. Ed Week combined two national data bases to show the educations and salaries of workers in five different job zones, defined by education, training and experience requirements. In Job Zone 3, where the median annual income is $35,672 nationally, 63 percent of job holders — such as electricians, funeral directors and legal secretaries — have some college education, including 26 percent who have a bachelor’s degree. The next step up, Job Zone 4 (such as teachers, accountants and detectives) with a median annual income of $50,552, has 89 percent of job holders with some college, including 68 percent with a bachelor’s degree. Job Zone 5, including lawyers, engineers and school psychologists, has a median income of $59,113 and only 7 percent without some college or a bachelor’s degree. In zone 2, median income $24,461, which includes retail sales clerks, sheet metal works and customer service representatives, 46 percent of job holders have some college, including 12 percent with bachelor’s degrees. In zone 1, median income $12,638, including waiters, cashiers and taxi drivers, 31 percent have some college including 7 percent with bachelor’s degrees. Career and technical education programs in high school “can reduce high school dropout rates and increase short- and medium-term earnings for students,” the report says. But if high schools are going to have any chance of preparing students for decent jobs in a market where college-level skills are increasingly necessary, they have to increase academic rigor, forge stronger links to local labor markets and high-demand, high-skill jobs and make better connections to postsecondary education “so that students have the option of going directly into the workplace or continuing with their formal education,” the report says. Educators have many factors to consider in making sure American students are prepared for whatever their futures may hold. 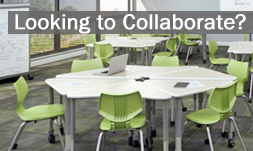 Let Worthington Direct help by providing a one stop shop for all of your school furniture needs. Visit their online store at www.worthingtondirect.com.